We manufacture these instruments using standard quality measures. These products are made up from high-grade raw materials and we supply these instruments at a reasonable price as per standards. These instruments are flexible and non-woven contains belts provided for a smooth and glossy finish on both sides of the fabrics. These are available in varied colors, our range is quality tested on well-defined quality parameters, thereby rendering utmost client satisfaction. We are offering a Air Permeability Testing Machine to our valuable customers. IS 11056 – 1984: Method for determination of Air Permeability of fabrics. DIN 55887: Testing of fabrics Determination & the Air Permeability of fabrics. 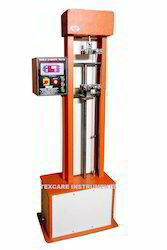 We have gained recognition as a flourishing organization for providing Fabric Tensile Testing Machine. We manufacture Non Woven Fabric Testing Instruments using standard quality measures. These are available in varied colors, our range is quality tested on well-defined quality parameters, thereby rendering utmost client satisfaction. We are a popular company known for providing Tensile Testing Machine For Non Woven Fabric to the clients.